Sandy is the award-winning author of A Far Cry…From Home and Grammy Do. She is a graduate of the Institute of Children’s Literature and a member of SCBWI. Ballroom dancer, Elvis enthusiast, and avid reader, Sandy shares these varied interests with her grandchildren every chance she gets. Sandy lives in Milford, MI with her husband, Joe. For more information, visit her website at sandy-richards.com. 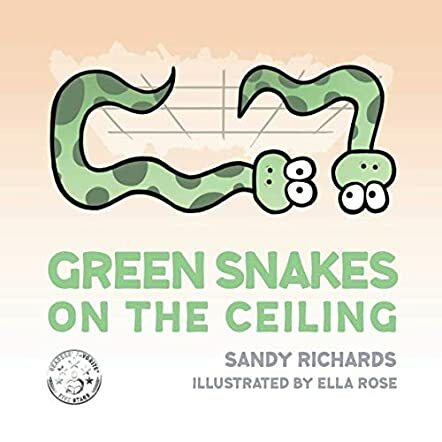 In her latest book, Green Snakes on the Ceiling, award-winning writer Sandy Richards has come up with a delightful way for children to learn colors and counting, along with identifying various animals who find themselves in the weirdest situations ever! You don’t have to be a child to visualize black bears on a beach or pink flamingos on skis, but you will find yourself smiling at the ideas while your imagination takes off with such scenarios. Such crazy concepts, supported by the brilliant illustrations of Ella Rose, will have even adults thinking “what if” or “how come” while an excited child asks you how a brown cow landed in a fountain, or what would happen if you found a skunk sleeping on your bed? If ever a book opened a treasure box of ways to stimulate children’s minds and imaginations, it’s Green Snakes on the Ceiling. And what a book for young classrooms! Every visual depicted, like tan pigs in a taxi or puppies going to school, invites children to create and/or write their own little stories based on that specific concept. If I were a primary school teacher, I couldn’t get this book into my classroom fast enough! Another thing that makes Green Snakes on the Ceiling extra good is Richards’ ability to rhyme. The entire book is a wonderful mixture of steady rhythm and naturally following rhymes. So many authors attempt to write children’s books using rhyme. So many handle that part poorly. But not Sandy Richards. Reading this book out loud provides an almost musical experience as well as a cerebral one. Bravo, Sandy Richards and Ella Rose. You make me want to pick up a pen and follow through on some of the creative story ideas you present. A thoroughly enjoyable and stimulating read for both children and adults. In Green Snakes on the Ceiling by Sandy Richards, which animal will be your favourite? Black bears on the beach, hungry horses at the table or the naughty five flies in the butter? Have you ever seen a tiger trying to tie a shoelace or an eel wearing earmuffs? There are creatures of all shapes and sizes, getting up to fun and mischief. This comical look at different animals will entertain as well as teach young readers all about adjectives or describing words, and verbs or action words. You will also discover how simple it is to learn your numbers up to ten and many colours along the way. The funny illustrations are a fantastic accompaniment to your little one's enjoyment of this wonderfully delightful tale of nature. Green Snakes on the Ceiling by Sandy Richards is a very well-written story that is the perfect bedtime read for small children. It has a great message behind the book, which is that everyone can try different things and not be placed in one specific box. The illustrations by Ella Rose are simple but quite comical and give the creatures a unique personality each. They are also perfect for the story and the age group of the child reader. A great story that children can read along with and memorize because of the cleverly constructed rhyming format. This book teaches your child about colours, grammar, and numbers, but also to have an appreciation of nature and acceptance of others. Excellent concept and this would make a great addition to a nursery library. Green Snakes on the Ceiling is an educational animal picture book for children, grades K-3, written by Sandy Richards and illustrated by Ella Rose. What do green snakes, orange toads, red crabs and blue fish all have in common? Several things, actually. Not only are colors being presented to new readers, but there’s also the mystery of what is wrong with each picture. Why is there a blue fish on the floor, and where should it really be? After exploring colors and discovering animals in all manner of unlikely places, Richards presents ten sets of animals that introduce counting, and from there, she introduces modifiers such as many, more, busy and hungry, spotted, striped and colorful. Alliteration is also covered in this charming book that goes a long way towards teaching kids elements of English vocabulary and grammar. Sandy Richards’ picture book for children, grades K-3, Green Snakes on the Ceiling, is a marvelous resource for anyone interested in challenging kids to think creatively. Along the way, they’ll be learning that dreaded subject, grammar, in a decidedly pleasant manner. I loved how each page makes you think a bit about the relationships being presented and how they merge with the pages surrounding them. Ella Rose’s pictures work so well with the premise of this outstanding educational resource. Her animal pictures are whimsical and fun; she even makes earwigs seem a little less awful with her clever treatment of them. I’d love to see this book used for adults who are learning English as a second language or have literacy issues. Unlike many children’s books, the subject matter is presented in a way that is not childish. The issues and aspects of language presented are crucial ones for ESL learners to master. Green Snakes on the Ceiling is most highly recommended. Thjs book is absolutely OUTSTANDING for any youngster. It is perfect for reading, learning colors, animals, and other integral parts of education. It is fun and exhilarating. 11 thumbs up! !